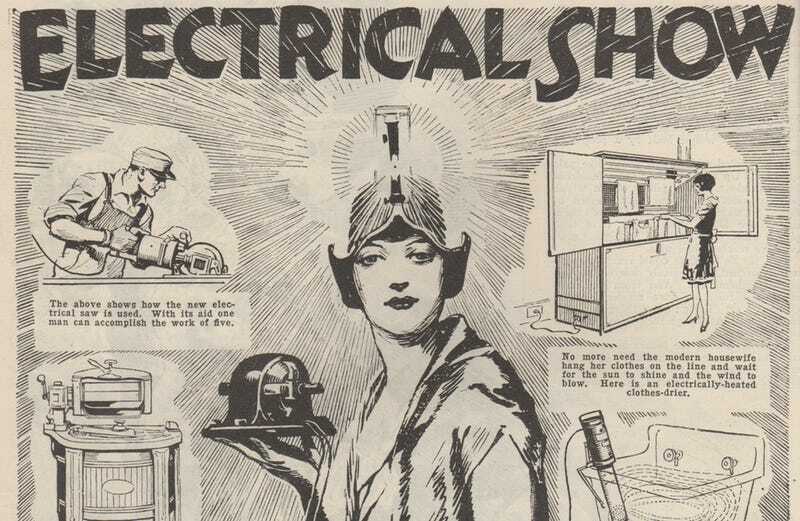 Back in the 1920s, the New York Electrical Show was a bit like the Consumer Electronics Show of its day. New Yorkers could head down to Grand Central Palace to check out the latest in high-tech gadgets — gadgets that were becoming increasingly popular as more and more Americans got electricity at home. Everything from electric juicers to electric saws were on display. And the January 1928 issue of Science and Invention magazine included a two-page spread of highlights from the 1927 show. In some ways it's amazing how far we haven't come in 87 years. The motor shown above will do everything from slicing potatoes to kneading dough for bread. An attachment will even clean your silverware. No more need the modern housewife hang her clothes on the line and wait for the sun to shine and the wind to blow. Here is an electrically heated clothes-drier. This motor-driven washer washes clothes in your tub by the vacuum cup principle. It can also be used with various attachments for sharpening knives, operating cream whippers, etc. An electric clock for alternating current circuits is indicated at the left. This, when once set, remains accurate to the second. The above shows how the new electrical saw is used. With its aid one man can accomplish the work of five. Here is a washing machine with a whirling drier, all portions of which are heavily coated with enamel. The drier has no holes. Infra-red rays produce a penetrating heat which will not burn the tissues. This is for medical treatments. One of the lightest washing machines is indicated above. This fits into any tub and will handle three sheets or the equivalent. The sun ray treatment is not left for hospitals alone. Here is an ultra-violet lamp for home use. A floor polisher, waxer or scrubber, motor-driven, is indicated here. When in operation, it can be guided with one finger. A Christmas tree holder with lights at its base, outlets for tree lights, and a well for water is shown above. Above we have a juice extractor which will take care of citrous fruits. It is electrically operated. The newest types of lamp shades are made of celluloid, artistically decorated and opalescent in their texture. For the modern apartments, we find the new styles of electrical stoves exhibited at the Electrical Show which sets into the wall. An automatic stoker which continuously feeds the fire and removes the ashes. It can be thermostatically controlled. Here is an automatic percolator with a thermostatic arrangement in the base, making overheating impossible. A button re-sets the thermostat. Here is a very reasonably priced combination washer and wringer. Either can be worked independently of the other, if desired.